Connect to the heart and soul of Portland! Every month, a group of 6 people come together as Urban Tellers® to stand and deliver the real, true stories that they have discovered, crafted, and honed in Portland Story Theater’s Art of Personal Narrative workshops. Told eye to eye, face to face, and heart to heart. $5 Arts for All PDX (Limit 2 - online or at the door, if seats are still available) Present your Oregon Trail Card at the door. Portland Story Theater participates in the Arts for All PDX program, which allows holders of the Oregon Trail Card to buy tickets for a reduced price of $5 each. Our Process: Our stories are co-created in a collaborative environment. All stories are told extemporaneously — No notes! No memorized scripts! 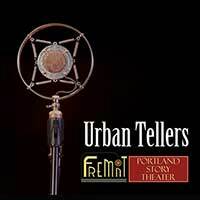 Listener Discretion Advised: Portland Story Theater's stories may contain explicit language, assorted escapades of a questionable nature, and various examples of extremely poor judgment, along with profound insights, deep revelations, and moments of truth, triumph, and transformation. Image Waiver: Videos, photographs, and audio clips are taken at all performances to be used for future promotional material. By attending this event, you are giving permission on behalf of yourself and/or each person in your group for Portland Story Theater, Inc. to use your image/audio clips for the sole purpose of future promotional materials without compensation or further permission.